Other than the bullet lodged near his heart, former Detroit cop Alex McKnight thought he had put the nightmare of his partner's death and his own near-fatal injury behind him. After all, the man convicted of the crimes has been locked away for years. But in the small town of Paradise, Michigan, where McKnight has traded his badge for a cabin in the woods, a murderer with the same unmistakable trademarks appears to be back. McKnight can't understand who else would know the intimate details of the old murders. And it seems like it'll be a frozen day in Hell before McKnight can unravel truth from deception in a town that's anything but Paradise. Steve Hamilton was born and raised in Detroit, and graduated from the University of Michigan where he won the prestigious Hopwood Award for fiction. In 2006, he won the Michigan Author Award for his outstanding body of work. 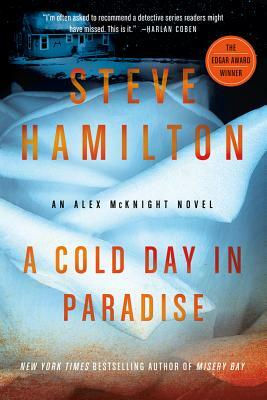 His novels have won numerous awards and media acclaim beginning with the very first in the Alex McKnight series, A Cold Day in Paradise, which won the Private Eye Writers of America/St. Martin's Press Award for Best First Mystery by an Unpublished Writer. Once published, it went on to win the MWA Edgar and the PWA Shamus Awards for Best First Novel, and was short-listed for the Anthony and Barry Awards. His book The Lock Artist is the winner of the 2011 Edgar Award for Best Novel. Hamilton currently works for IBM in upstate New York where he lives with his wife Julia and their two children.